Let’s check our handy-dandy countdown clock — it’s 55 days (!) to our wedding on September 26. I would’ve done a progress post 60 days out, but we had a couple of cake tastings this week, and I wanted to wait until after that. Here are photos from the two tastings we had last week, first Gerhard Michler (Creative International Pastries). They are a large bakery, and their major work is in desserts other than wedding cakes, so they had us taste some individual desserts that represent some of the cake flavors/fillings they have available (clockwise from upper left: chocolate mousse/cake, lemon foam/white cake, vanilla cream/white cake with strawberries, and raspberry cream/white cake with raspberry jam stripes; and not pictured, mango-passionfruit mousse/white cake). And here’s Sugarcoat It Studio, a one-woman operation run by Krista Markell. This photo is after we’d already started eating and suddenly remembered, oh picture! (banana cake with cream-cheese frosting, chocolate cake with layer of ganache and chocolate frosting, and lemon cake with vanilla frosting). When we scheduled the tasting, Thom mentioned it happened to be his birthday, so she had put a candle in one of the cakes! Very cute and thoughtful. We didn’t sing “Happy Birthday,” but she did light the candle for him, and he blew it out and everything. He joked that, whew, I was off the hook getting him a birthday cake. So we’ve decided to go with Sugarcoat It Studio. As you may know, one of our interests is midcentury design, and Krista totally gets that vibe. We met with her yesterday and brought a whole bunch of inspirations (not only cake inspirations, but also designs/prints we like: tiki, tropical, modern, Shag, etc. ), and she started to sketch a few ideas that look really promising. Can’t wait to hear back and see her designs. A couple of weeks ago we went to Men’s Wearhouse to get our suits marked for alterations, and they should be ready any day now. At one point we had thought of changing into barongs (traditional Filipino shirts) for the reception, but we’re liking our suits so much we may nix the costume change. No biggie. We got our invitations and info cards from Hello Lucky, and just mailed out a whole bunch! 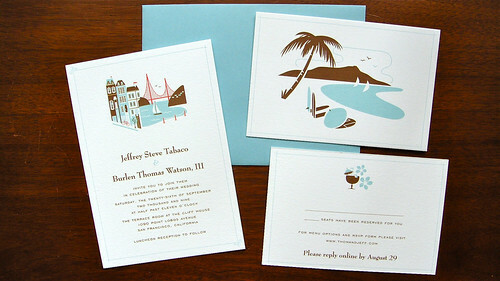 The main design on the invitation is called “Visit San Francisco,” which matches our save-the-dates. For the info card, we decided to mix and match, and go with a complementing design from the “Visit Hawaii” line in order to hint at the tropical theme of our reception. The cards have space for the guests’ names and the number of seats reserved, and have the URL of our wedding website. Borrowing from other cultural wedding traditions, we’ll have a document that we will sign after the ceremony. Our friend Peg suggested the idea and offered to get us one as a wedding present; she referred us to a friend who does calligraphy and design, Pamela La Regina of Supercalligraphics. I’m excited about it, since it will incorporate design elements that relate to our theme, and there will also be space on the document for all our guests to sign as witnesses (a Quaker tradition). I love that. Some of the to-dos: shoot engagement photos; find accessories (shirts, ties, shoes); formulate ceremony and pick music for ceremony, cocktail hour, and reception; choose hors d’oeuvres and wines; refine ideas for flowers, centerpieces, and favors; and oh, can’t forget the rings! This entry was posted on Sunday, August 2, 2009 at 2:44 am and is filed under Wedding. You can leave a comment and follow any responses to this entry through the RSS 2.0 feed. Those cakes looked stunning! 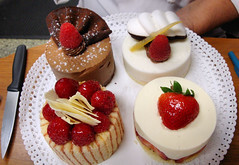 I am looking forward to our cake tasting as well (though I have white in mind – as I’m pretty much a vanilla guy anyway :). The Partner and I exchanged rings a few years back so that’s one thing we don’t have to do before the ceremony. We took our rings off earlier this year and will put them on each other properly at the wedding (I have to admit that I miss wearing my wedding band – and can’t wait to get it back on my finger where it belongs!). We got the initial concept sketch from our cake designer two days ago, and were blown away. The final cake is going to look amazing. We’re deciding now on what flavors, but I think we’re probably going with lemon cake and limoncello-infused buttercream filling for the bottom two layers, and coconut cream cake with coconut buttercream and toasted coconut filling for the top tier. I’m also especially excited today because we just found out that we’re going to be able to commission the illustrator who drew the print from which our cake’s design is inspired to draw a 11″x14″ stylized illustration of the two of us, in the same retro-modern style. He doesn’t generally take such commissions, but when I told him about taking the cake’s inspiration from one of the original prints we’d purchased from him two years ago, he cheerfully agreed to do this for us. We’ll frame it and display it on the cake table at the reception. What do your wedding bands look like? We’re really struggling with finding something that “clicks” with us in the same way the save-the-dates, invitations and cake designs did. We’ve seen lots of things that are maybes, but nothing yet that’s spot-on perfect, and I’m worried we’re running out of time, especially if we end up wanting a custom design.